We know that Disney Interactive is capable of producing quality apps that aren’t based on classic Disney characters: Where’s My Water—which features a cartoon alligator named Swampy who was created specifically for a mobile game—has had plenty of App Store success on its own, without a major movie or show. But Disney Interactive announced a new iPhone app on Wednesday that’s neither game nor animated. In fact, it’s not pushing a Disney product or message at all. It’s called Story, and it’s designed to help you organize your digital media into a sharable storyline. Scott Gerlach, Disney Interactive’s Director of Engineering, said he and his development team wanted to make an app to help people get content off of their phones and out to a place that’s more widely accessible, with an emphasis on parents. “New parents collect more media on their mobile devices than anyone else, but they aren’t doing anything with it,” Gerlach said in an interview, “and they want to share it, but what’s the best way?” Facebook is an obvious dumping ground for photos and videos, but sometimes you might prefer to share photos with a select group of friends, in which case Facebook isn’t ideal. Or the people with whom you want to share these photos—namely, grandparents—haven’t adopted Facebook just yet. 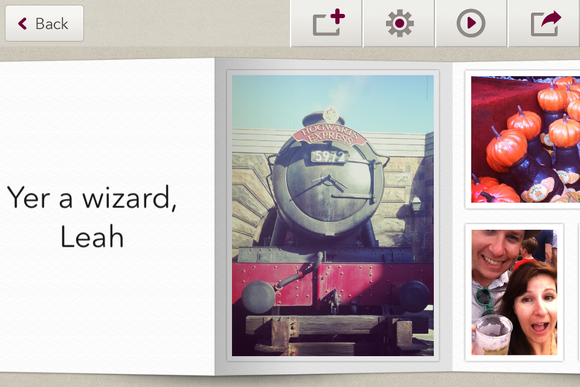 Story puts your cherished moments into a sharable storyline with just a few taps. That’s where Story comes in. Story connects to your Camera Roll and groups photos based on location and when they were taken. These photo collections, called moments, are suggested memories that you then can compile to complete your story. Pick which photos to work with, drag-and-drop them in the correct order, customize your template, and add captions to tell your story the way you want it to be told. Finally, share completed stories with friends and family through email or Facebook: stories are displayed as a book, with fluid page turning and animation. I had a chance to get some hands-on time with Story before it launched. Overall, I found Story very intuitive to use with nice in-app editing features and a stunning final product. As mentioned above, when you launch Story and allow the app to have access to the contents of your Camera Roll, you’ll see suggested moments of your photos and videos based on when and where they were taken. You can also view all of your completed Stories on the app’s main landing page. If you like the photo order and theme that Story suggests for that moment, you can share that moment as-is. But I prefer to customize my moments a bit. Story provides five different themes: one features Mickey Mouse, while the others are more nondescript. 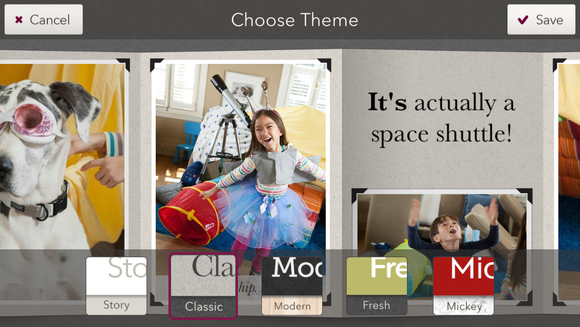 Select your theme, and then drag and drop photos in the order you’d like to see them. Gerlach mentioned that additional themes are likely be added to Story in later app updates. 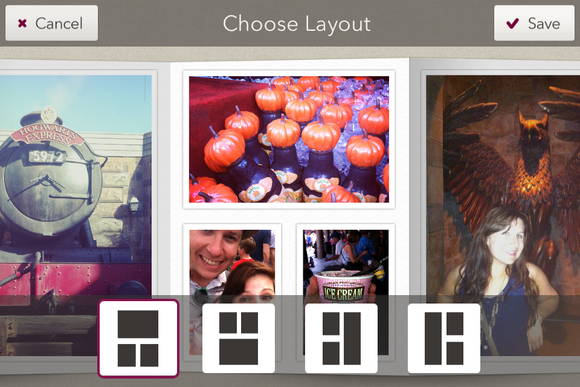 Photos can be organized onto pages, with up to four images per page. Play around with how photos are organized on a page by dragging and dropping them around; tap on a photo once to view different page layouts. Photos can also be cropped, edited, or deleted individually—just double-tap on an image to edit it further. From here, use pinch-to-zoom to get the crop you want, and then slide the photo in to place. Tap the button in the bottom right corner to add a caption. If you’d like to add a photo that wasn’t grouped within the suggested moment, you can do that by tapping the Add Media button at the top of the screen. Actually, the Add Media button is your main hub for all customization. Tap this button—the first one on the left of four control buttons—to add photos, add text, take a new photo or video, or change the theme. No story is complete without a title page and text pages in between photos to describe the action—moments are given a title page with the date the photos were taken by default. To view your story in progress, tap the play button to watch your story scroll by. If you want to make a story comprised of photos that have a lengthier time frame—say, highlights of your child’s third-grade year—you can make a story from scratch. When you’re ready to share your story, tap the share button. Story lets you share your collection through email or Facebook. When you email your story, recipients are prompted to click on a link that directs them to a unique webpage through story.us, where your story lives. These webpages are randomized and “unguessable,” according to Disney Interactive, and can only be accessed by those who have the direct link. 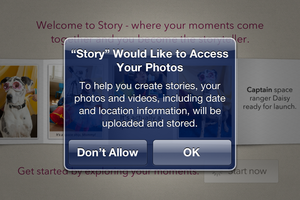 This way, Story users can make their photo streams as public or private as they want. 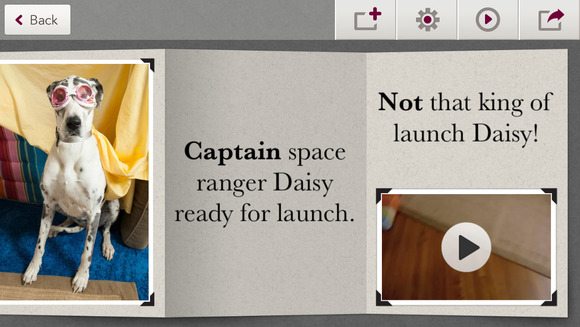 While Story is off to a promising start, some additional features are necessary to make it an App Store darling. One feature I’d like to see is a place to store all of your collective stories online, so you can easily share and monitor your stories in one place. Currently, Story allows you to create a link through story.us that can be shared via e-mail or Facebook, but it’s a randomized link that isn’t associated with any public account. While Disney says this is both for privacy and simplicity reasons, having all of your stories in one easily sharable location might simplify sharing even more. Grandma can not only see the latest Story from Sally’s karate class, but she can take another look at Sally’s birthday Story, too, without having to open a separate email or click a separate link. Story will be available Wednesday on the App Store. This free app is compatible with the iPhone running iOS 5 or newer.